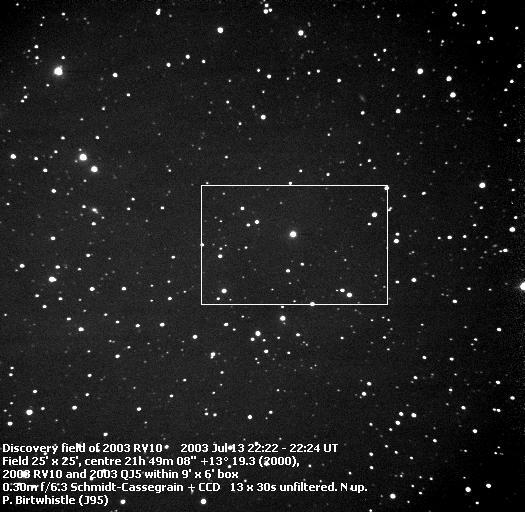 On the night of 2003 September 13/14th the Minor Planet Center's NEO Confirmation page (NEOCP) had a number of newly discovered objects listed as requiring observation and four were imaged during that evening from Great Shefford. Three turned out to be new NEO objects and were eventually designated as 2003 RL10, 2003 RM10 and 2003 RN10. The last one attempted that evening had a temporary designation of 59D002, the normal style of designation given by discoveries from the Lowell Observatory LONEOS survey. It was listed as being of magnitude +17.3 and travelling almost due south at 1.7"/minute. As usual, a series of images was taken and then stacked together into three sets, taking into account the known motion of the object and then blinked using Astrometrica to try and reveal the target. When the images were examined an object of about the right brightness could be seen moving south as expected, but about 7' to the west of the predicted place. Seconds later another object also about the right brightness and moving south was noticed, much nearer the predicted place. 59D002 was presumed to be the second object and the MPC's Minor Planet Checker web service was used to see which known asteroids were in the vicinity of the first object. There were four asteroids within a degree of the new object, three had well determined orbits having been seen at three or more oppositions. The closest of these was 23' away and obviously none of the three could be identified with the first object.. The remaining known object listed by the Minor Planet Checker was 2003 QJ5, discovered on 2003 Aug 21st. It had appeared on the NEOCP at that time, but was determined not to be a NEO and so was taken off the page on Aug 22nd. and had remained unobserved since that time. Although the predicted place of 2003 QJ5 was by now rather off track the MPC quickly established that 59D002 was the same as 2003 QJ5 and took 59D002 off the NEOCP less than an hour after I had taken my first image of it. There was no known asteroid that could be identified with the new object I had found! I gave it a temporary designation of GS0304 and sent the astrometry off to the MPC just after midnight local time. About half an hour later the MPC indicated it looked like a new one. This is the boxed area above as a stack of four frames compensating for the motion of 2003 RV10, with both 2003 QJ5 and 2003 RV10 marked. Click on the image for an animation (241k). Four images each of 30 seconds exposure stacked to compensate for the motion of 2003 RV10 (and 2003 QJ5). Follow-up positions were required on a second night to confirm whether the new object was indeed a new discovery. I was fully expecting another observatory that may have been imaging 59D002 that same night to manage to follow up and confirm the object before me. Luckily the next night Sept 14/15 was clear and more positions were obtained. These were sent off to the MPC and a few hours later they sent back the designation GS0304 = 2003 RV10, indicating that it had been credited as a new discovery from Great Shefford! (Luckily, as it turned out, only one other observatory had reported positions of 2003 QJ5 that first night and that observatory had not submitted positions for 2003 RV10). With just two days of positions the MPC published a Väisälä orbit (calculated assuming that the object is at perihelion at the moment of one of the observations). This is often a good assumption with a newly discovered asteroid, but can only predict positions approximately more than a few days into the future. More astrometry was therefore obtained the next night and with three nights the MPC published a general orbit for 2003 RV10 and managed to link it to three positions reported three weeks earlier from the NEAT survey at Palomar. As no other observations were made at that time it could not be attributed to NEAT and was left as a one night stand. 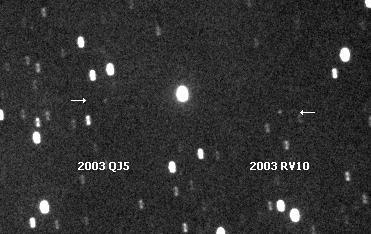 2003 RV10 has a moderately eccentric orbit (e=0.29) and inclination (i=30°) and was at its closest to the sun two months before discovery, at the end of June 2003. It will be a difficult object to follow after this opposition, only reaching magnitude 20.7 at its next opposition in winter 2004/5. It will be July 2007 before it returns with similar brightness to 2003. If you can make follow-up observations then click here to generate an ephemeris, they would be very welcome.